Plain Paper is an English-language magazine on and about paper. The current issue revolves around the theme: surface. 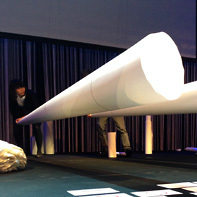 Paper can be seen as synonymous with surface through and through. It is a layer located in between the worlds of 2D and 3D. The surface of paper can be smooth, rough, gloss, silk, matt, touch, anything! The best kept secret of a paper machine is the size press, the segment of the machine used to apply starch, pigments or chemicals to the surface of the paper to enhance its printing characteristics. A good surface is what makes an accomplished sheet of paper. 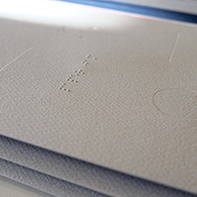 Plain paper can be post-processed with an embossing, laser cut, varnish or lacquer, thereby further changing the relief and affecting the perception of its surface. Surface has many depths, as it were. When we speak of the printed text or image as shallow or profound, we refer to a dimension entirely distinct from the surface of the paper it appears on. As designers, it is our fascination for the subject of paper that drew us to the idea of a magazine dedicated to a multi-faceted exploration of paper. Touching paper is an intimate affair, something you won’t experience on the Internet.